Maintenance drug is Tenormin (50 mg in the morning and 25 mg at night). The family has been against the placement of an implantable cardioverter-defibrillator (ICD), and at 22 years of age, additional testing was performed to help with risk stratification. The Holter revealed ventricular ectopy but no runs of ventricular tachycardia. His stress test confirmed the presence of an abnormal fall in BP with exercise. 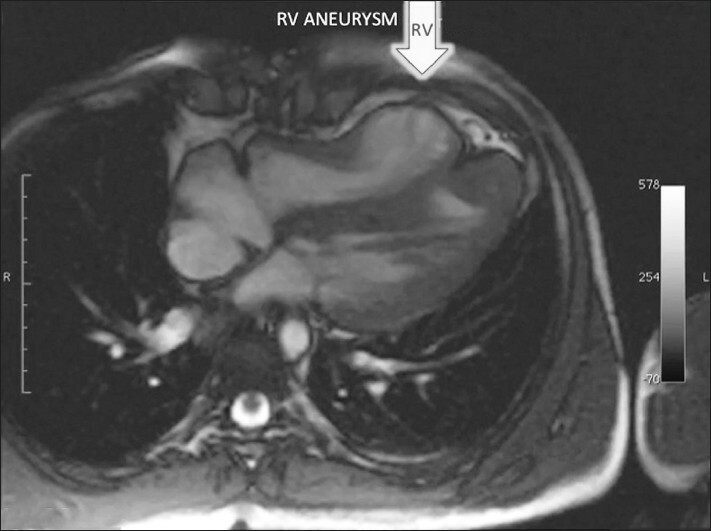 Magnetic resonance imaging (MRI) demonstrated an RV aneurysm with no obvious thrombus [Figure 1] and [Figure 2]. Chest radiograph may suggest LV hypertrophy. Stress echocardiography is performed in patients with HCM to assess the functional significance of LVOT obstruction. Transesophageal echocardiography can be conducted in subjects with technically limited imaging or as part of intraoperative monitoring during surgical intervention. MRI plays an important diagnostic role in its ability to visualize areas of myocardium that are inadequately evaluated by ultrasound. Percutaneous alcohol septal ablation consideration is always second line because of formation of scar tissue in the myocardium. 1. Lauschke J, Maisch B. Athlete's heart or hypertrophic cardiomyopathy? Clin Res Cardiol 2009;98:80-8. 2. Marian AJ. Hypertrophic cardiomyopathy: From genetics to treatment. Eur J Clin Invest 2010;40:360-9. 3. Wigle ED, Sasson Z, Henderson MA, Ruddy TD, Fulop J, Rakowski H, et al. Hypertrophic cardiomyopathy. The importance of the site and the extent of hypertrophy. A review. Prog Cardiovasc Dis 1985;28:1-83. 4. Maron BJ, Roberts WC, Epstein SE. Sudden death in hypertrophic cardiomyopathy: Profile of 78 patients. Circulation 1982;65:1388-94. 5. Maron BJ, Towbin JA, Thiene G, Antzelevitch C, Corrado D, Arnett D, et al. Contemporary definitions and classification of the cardiomyopathies: An American Heart Association Scientific Statement from the Council on Clinical Cardiology, Heart Failure and Transplantation Committee; Quality of Care and Outcomes Research and Functional Genomics and Translational Biology Interdisciplinary Working Groups; and Council on Epidemiology and Prevention. Circulation 2006;113:1807-16. 6. Maron BJ. Hypertrophic cardiomyopathy: A systematic review. JAMA 2002;287:1308-20. 7. Spirito P, Seidman CE, McKenna WJ, Maron BJ. The management of hypertrophic cardiomyopathy. N Engl J Med 1997;336:775-85. 8. Maron BJ, McKenna WJ, Danielson GK, Kappenberger LJ, Kuhn HJ, Seidman CE, et al. American college of cardiology/European society of cardiology. A report of the American College of Cardiology Foundation Task Force on Clinical Expert Consensus Documents and the European Society of Cardiology Committee for Practice Guidelines. J Am Coll Cardiol 2003;42:1687-713. 9. Elliott PM, Poloniecki J, Dickie S, Sharma S, Monserrat L, Varnava A, et al. Sudden death in hypertrophic cardiomyopathy: Identification of high risk patients. J Am Coll Cardiol 2000;36:2212-8. 10. Spirito P, Bellone P, Harris KM, Bernabo P, Bruzzi P, Maron BJ. Magnitude of left ventricular hypertrophy and risk of sudden death in hypertrophic cardiomyopathy. N Engl J Med 2000;342:1778-85. 11. Wigle ED, Rakowski H, Kimball BP, Williams WG. Hypertrophic cardiomyopathy. Clinical spectrum and treatment. Circulation 1995;92:1680-92. 12. Autore C, Bernabo P, Barilla CS, Bruzzi P, Spirito P. The prognostic importance of left ventricular outflow obstruction in hypertrophic cardiomyopathy varies in relation to the severity of symptoms. J Am Coll Cardiol 2005;45:1076-80. 13. Braunwald E, Lambrew CT, Rockoff SD, Ross J Jr, Morrow AG. Idiopathic hypertrophic subaortic stenosis. A Description of the disease based upon an analysis of 64 patients. Circulation 1964;30: SUPPL 4:3-119. 14. Maron BJ. Hypertrophic cardiomyopathy. Lancet 1997;350:127-33. 15. Lewis JF, Maron BJ. Elderly patients with hypertrophic cardiomyopathy: A subset with distinctive left ventricular morphology and progressive clinical course late in life. J Am Coll Cardiol 1989;13:36-45. 16. Lewis JF, Maron BJ. Clinical and morphologic expression of hypertrophic cardiomyopathy in patients greater than 65 years of age. Am J Cardiol 1994;73:1105-11. 17. Lever HM, Karam RF, Currie PJ, Healy BP. Hypertrophic cardiomyopathy in the elderly. Distinctions from the young based on cardiac shape. Circulation 1989;79:580-9. 18. Sherrid MV, Gunsburg DZ, Moldenhauer S, Pearle G. Systolic anterior motion begins at low left ventricular outflow tract velocity in obstructive hypertrophic cardiomyopathy. J Am Coll Cardiol 2000;36:1344-54. 19. Sherrid MV, Chu CK, Delia E, Mogtader A, Dwyer EM Jr. An echocardiographic study of the fluid mechanics of obstruction in hypertrophic cardiomyopathy. J Am Coll Cardiol 1993;22:816-25. 20. Sherrid MV. Dynamic left ventricular outflow obstruction in hypertrophic cardiomyopathy revisited: Significance, pathogenesis, and treatment. Cardiol Rev 1998;6:135-45. 21. Jiang L, Levine RA, King ME, Weyman AE. Integrated mechanism for systolic anterior motion of the mitral valve in hypertrophic cardiomyopathy based on echocardiographic observations. Am Heart J 1987;113:633-44. 22. Wigle ED, Adelman AG, Auger P, Marquis Y. Mitral regurgitation in muscular subaortic stenosis. Am J Cardiol 1969;24:698-706. 23. Nihoyannopoulos P, Karatasakis G, Frenneaux M, McKenna WJ, Oakley CM. Diastolic function in hypertrophic cardiomyopathy: Relation to exercise capacity. J Am Coll Cardiol 1992;19:536-40. 24. Bonow RO, Dilsizian V, Rosing DR, Maron BJ, Bacharach SL, Green MV. Verapamil-induced improvement in left ventricular diastolic filling and increased exercise tolerance in patients with hypertrophic cardiomyopathy: Short- and long-term effects. Circulation 1985;72:853-64. 25. Bonow RO, Vitale DF, Maron BJ, Bacharach SL, Frederick TM, Green MV. Regional left ventricular asynchrony and impaired global left ventricular filling in hypertrophic cardiomyopathy: Effect of verapamil. J Am Coll Cardiol 1987;9:1108-16. 26. Frank S, Braunwald E. Idiopathic hypertrophic subaortic stenosis. Clinical analysis of 126 patients with emphasis on the natural history. Circulation 1968;37:759-88. 27. Maron BJ, Gottdiener JS, Epstein SE. Patterns and significance of distribution of left ventricular hypertrophy in hypertrophic cardiomyopathy. A wide angle, two dimensional echocardiographic study of 125 patients. Am J Cardiol 1981;48:418-28. 28. Shapiro LM, McKenna WJ. Distribution of left ventricular hypertrophy in hypertrophic cardiomyopathy: A two-dimensional echocardiographic study. J Am Coll Cardiol 1983;2:437-44. 29. Klues HG, Schiffers A, Maron BJ. Phenotypic spectrum and patterns of left ventricular hypertrophy in hypertrophic cardiomyopathy: Morphologic observations and significance as assessed by two-dimensional echocardiography in 600 patients. J Am Coll Cardiol 1995;26:1699-708. 30. Maron BJ, Isner JM, McKenna WJ. 26th Bethesda conference: Recommendations for determining eligibility for competition in athletes with cardiovascular abnormalities. Task Force 3: hypertrophic cardiomyopathy, myocarditis and other myopericardial diseases and mitral valve prolapse. J Am Coll Cardiol 1994;24:880-5. 31. Maron BJ, Bonow RO, Cannon RO 3rd, Leon MB, Epstein SE. Hypertrophic cardiomyopathy. Interrelations of clinical manifestations, pathophysiology, and therapy (1). N Engl J Med 1987;316:780-9. 32. Maron BJ, Bonow RO, Cannon RO 3rd, Leon MB, Epstein SE. Hypertrophic cardiomyopathy. Interrelations of clinical manifestations, pathophysiology, and therapy (2). N Engl J Med 1987;316:844-52. 33. Frank MJ, Abdulla AM, Canedo MI, Saylors RE. Long-term medical management of hypertrophic obstructive cardiomyopathy. Am J Cardiol 1978;42:993-1001. 34. Adelman AG, Shah PM, Gramiak R, Wigle ED. Long-term propranolol therapy in muscular subaortic stenosis. Br Heart J 1970;32:804-11. 35. Shah PM, Gramiak R, Adelman AG, Wigle ED. Echocardiographic assessment of the effects of surgery and propranolol on the dynamics of outflow obstruction in hypertrophic subaortic stenosis. Circulation 1972;45:516-21. 36. Kaltenbach M, Hopf R, Kober G, Bussmann WD, Keller M, Petersen Y. Treatment of hypertrophic obstructive cardiomyopathy with verapamil. Br Heart J 1979;42:35-42. 37. Rosing DR, Condit JR, Maron BJ, Kent KM, Leon MB, Bonow RO, et al. Verapamil therapy: A new approach to the pharmacologic treatment of hypertrophic cardiomyopathy: III. Effects of long-term administration. Am J Cardiol 1981;48:545-53. 38. Rosing DR, Kent KM, Borer JS, Seides SF, Maron BJ, Epstein SE. Verapamil therapy: A new approach to the pharmacologic treatment of hypertrophic cardiomyopathy. I. Hemodynamic effects. Circulation 1979;60:1201-7. 39. Rosing DR, Kent KM, Maron BJ, Epstein SE. Verapamil therapy: A new approach to the pharmacologic treatment of hypertrophic cardiomyopathy. II. Effects on exercise capacity and symptomatic status. Circulation 1979;60:1208-13. 40. Bonow RO, Frederick TM, Bacharach SL, Green MV, Goose PW, Maron BJ, et al. Atrial systole and left ventricular filling in hypertrophic cardiomyopathy: Effect of verapamil. Am J Cardiol 1983;51:1386-91. 41. Bonow RO, Ostrow HG, Rosing DR, Cannon RO 3rd, Lipson LC, Maron BJ, et al. Effects of verapamil on left ventricular systolic and diastolic function in patients with hypertrophic cardiomyopathy: Pressure-volume analysis with a nonimaging scintillation probe. Circulation 1983;68:1062-73. 42. Bonow RO, Rosing DR, Bacharach SL, Green MV, Kent KM, Lipson LC, et al. Effects of verapamil on left ventricular systolic function and diastolic filling in patients with hypertrophic cardiomyopathy. Circulation 1981;64:787-96. 43. Matsubara H, Nakatani S, Nagata S, Ishikura F, Katagiri Y, Ohe T, et al. Salutary effect of disopyramide on left ventricular diastolic function in hypertrophic obstructive cardiomyopathy. J Am Coll Cardiol 1995;26:768-75. 44. Pollick C, Kimball B, Henderson M, Wigle ED. Disopyramide in hypertrophic cardiomyopathy. I. Hemodynamic assessment after intravenous administration. Am J Cardiol 1988;62:1248-51. 45. Pollick C. Muscular subaortic stenosis: hemodynamic and clinical improvement after disopyramide. N Engl J Med. 1982 Oct 14; 307:997-9. 46. Sherrid M, Delia E, Dwyer E. Oral disopyramide therapy for obstructive hypertrophic cardiomyopathy. Am J Cardiol 1988;62:1085-8. 47. Cohn LH, Trehan H, Collins JJ Jr. Long-term follow-up of patients undergoing myotomy/myectomy for obstructive hypertrophic cardiomyopathy. Am J Cardiol 1992;70:657-60. 48. Havndrup O, Pettersson G, Kjeldsen K, Bundgaard H. Outcome of septal myectomy in patients with hypertrophic obstructive cardiomyopathy. Scand Cardiovasc J 2000;34:564-9. 49. Williams WG, Wigle ED, Rakowski H, Smallhorn J, LeBlanc J, Trusler GA. Results of surgery for hypertrophic obstructive cardiomyopathy. Circulation 1987;76:V104-8. 50. McCully RB, Nishimura RA, Bailey KR, Schaff HV, Danielson GK, Tajik AJ. Hypertrophic obstructive cardiomyopathy: Preoperative echocardiographic predictors of outcome after septal myectomy. J Am Coll Cardiol 1996;27:1491-6. 51. McCully RB, Nishimura RA, Tajik AJ, Schaff HV, Danielson GK. Extent of clinical improvement after surgical treatment of hypertrophic obstructive cardiomyopathy. Circulation 1996;94:467-71. 52. McIntosh CL, Maron BJ. Current operative treatment of obstructive hypertrophic cardiomyopathy. Circulation 1988;78:487-95. 53. Merrill WH, Friesinger GC, Graham TP Jr, Byrd BF 3rd, Drinkwater DC Jr, Christian KG, et al. Long-lasting improvement after septal myectomy for hypertrophic obstructive cardiomyopathy. Ann Thorac Surg 2000;69:1732-5. 54. Schulte HD, Borisov K, Gams E, Gramsch-Zabel H, Lösse B, Schwartzkopff B. Management of symptomatic hypertrophic obstructive cardiomyopathy--long-term results after surgical therapy. Thorac Cardiovasc Surg 1999;47:213-8. 55. Schulte HD, Bircks WH, Loesse B, Godehardt EA, Schwartzkopff B. Prognosis of patients with hypertrophic obstructive cardiomyopathy after transaortic myectomy. Late results up to twenty-five years. J Thorac Cardiovasc Surg 1993;106:709-17. 56. Ten Berg JM, Suttorp MJ, Knaepen PJ, Ernst SM, Vermeulen FE, Jaarsma W. Hypertrophic obstructive cardiomyopathy. Initial results and long-term follow-up after Morrow septal myectomy. Circulation 1994;90:1781-5. 57. Partanen J, Kupari M, Heikkila J, Keto P. Left ventricular aneurysm associated with apical hypertrophic cardiomyopathy. Clin Cardiol 1991;14:936-9. 58. Paul M, Schafers M, Grude M, Reinke F, Juergens KU, Fischbach R, et al. 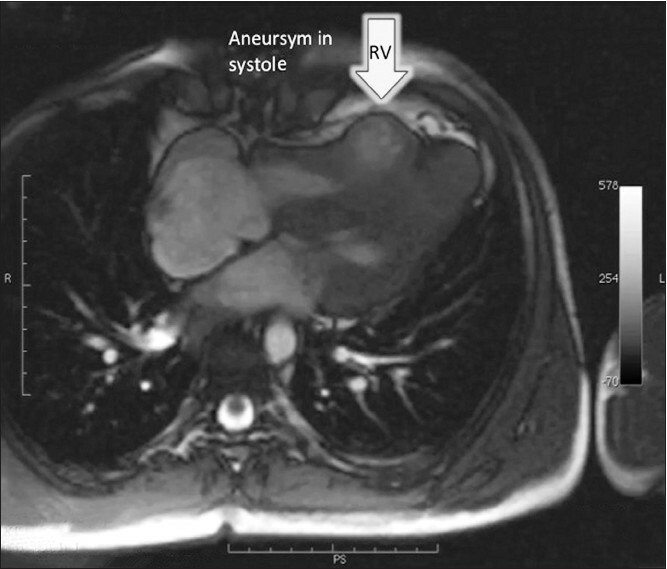 Idiopathic left ventricular aneurysm and sudden cardiac death in young adults. Europace 2006;8:607-12.